Interesting study by Spencer Stuart. Their main finding is that the average tenure for CMOs of leading US consumer brand companies increased to 44 months from 42 months, but these other stats are eye opening! While a significant number of companies selected yet-unproven marketers for the top marketing job, we saw an increase in the number of companies selecting experienced CMOs in 2017. Nine of 21 new CMOs (43%) had prior CMO experience, compared with 37% in 2016. 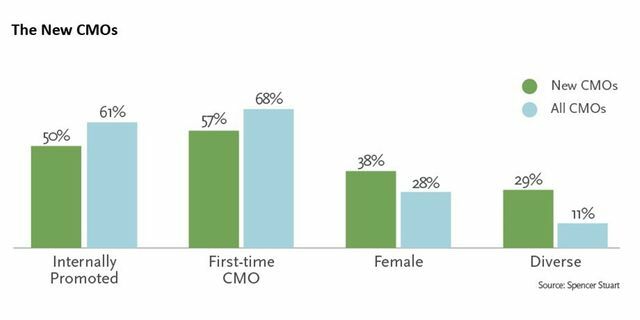 Half of the new CMOs were promoted from within, compared with 69% in 2016. New CMOs in 2017 are more likely to be female than the previous year (38% compared with 31%). Six of the new CMOs (29%) are minorities, which represents a significant increase from 2016, when only one of the new class of CMOs was diverse (6%). Looking at the profiles of all CMOs in the study, 61% were promoted into their current roles. Only 11% of all CMOs are minorities and 28% are women.